Download "CUSTOMER COPY Credit Agreement"
1 CUSTOMER COPY Credit Agreement IMPORTANT INFORMATION 1. Amount of credit limit: Credit limit is notified to you from time to time. 2. Duration of agreement: No fixed period, see Condition 8 of the Terms and Conditions. 3. Number and frequency of repayment installments: No fixed number. Monthly (unless otherwise agreed). 4. Amount of each installment: As detailed in financial details about the card below. 5. Annual Percentage Rate of Charge (APR)*: Total cost of credit including any interest and fees 19.1%. 6. Total amount payable*: 1, is what you might pay in year 1 if this happens: Your credit limit is 1,500; On opening the account you make one purchase with your card to the value of 1,470 plus Government Stamp Duty charge of 30.00; interest is charged at the standard rate for purchases; you repay the 1,500 purchase amount in 12 equal monthly payments of 125, each made on time; and during the year you don't carry out any more transactions and your interest rates don't change. Remember this is just an example and the total amount you might have to pay could vary. * The APR above is based on a representative credit limit of 1,500 and incorporates the highest interest rate applicable to purchases but does not incorporate the introductory interest rate. THIS IS A COPY OF YOUR AGREEMENT FOR YOU TO KEEP. This is a Tesco Clubcard Credit Card agreement made between us, (Tesco Personal Finance plc, P.O. Box 7520, Dublin 2) and you, the principal cardholder. 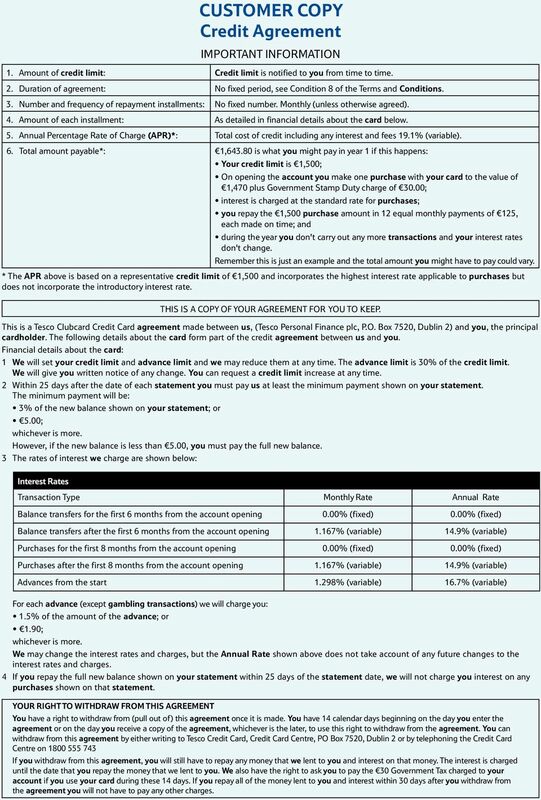 The following details about the card form part of the credit agreement between us and you. Financial details about the card: 1 We will set your credit limit and advance limit and we may reduce them at any time. The advance limit is 30% of the credit limit. We will give you written notice of any change. You can request a credit limit increase at any time. 2 Within 25 days after the date of each statement you must pay us at least the minimum payment shown on your statement. The minimum payment will be: 3% of the new balance shown on your statement; or 5.00; whichever is more. However, if the new balance is less than 5.00, you must pay the full new balance. 3 The rates of interest we charge are shown below: Interest Rates Transaction Type Monthly Rate Annual Rate Balance transfers for the first 6 months from the account opening 0.00% (fixed) 0.00% (fixed) Balance transfers after the first 6 months from the account opening 1.167% 14.9% Purchases for the first 8 months from the account opening 0.00% (fixed) 0.00% (fixed) Purchases after the first 8 months from the account opening 1.167% 14.9% Advances from the start 1.298% 16.7% For each advance (except gambling transactions) we will charge you: 1.5% of the amount of the advance; or 1.90; whichever is more. We may change the interest rates and charges, but the Annual Rate shown above does not take account of any future changes to the interest rates and charges. 4 If you repay the full new balance shown on your statement within 25 days of the statement date, we will not charge you interest on any purchases shown on that statement. YOUR RIGHT TO WITHDRAW FROM THIS AGREEMENT You have a right to withdraw from (pull out of) this agreement once it is made. You have 14 calendar days beginning on the day you enter the agreement or on the day you receive a copy of the agreement, whichever is the later, to use this right to withdraw from the agreement. 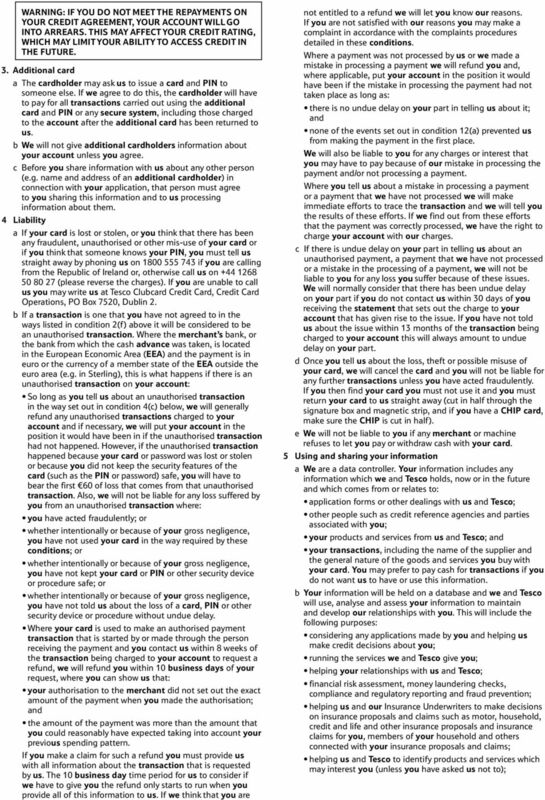 You can withdraw from this agreement by either writing to Tesco Credit Card, Credit Card Centre, PO Box 7520, Dublin 2 or by telephoning the Credit Card Centre on If you withdraw from this agreement, you will still have to repay any money that we lent to you and interest on that money. The interest is charged until the date that you repay the money that we lent to you. We also have the right to ask you to pay the 30 Government Tax charged to your account if you use your card during these 14 days. If you repay all of the money lent to you and interest within 30 days after you withdraw from the agreement you will not have to pay any other charges. 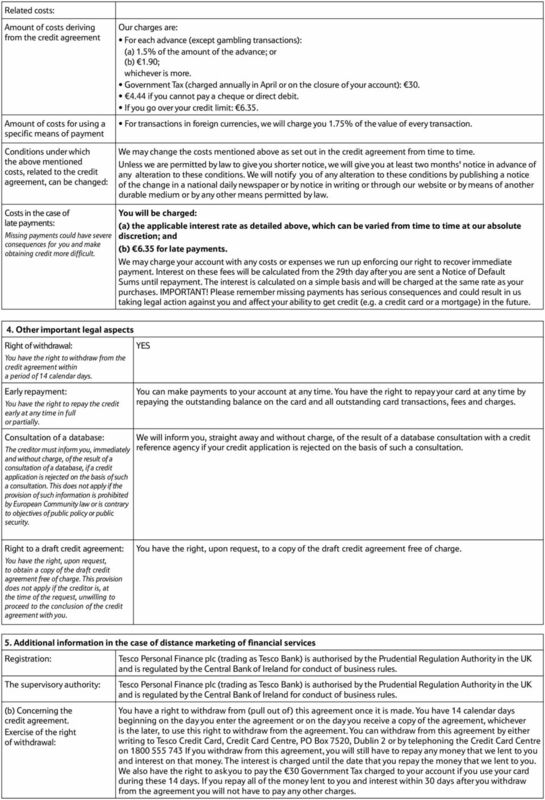 2 Tesco Credit Card Terms and Conditions Credit Agreement. 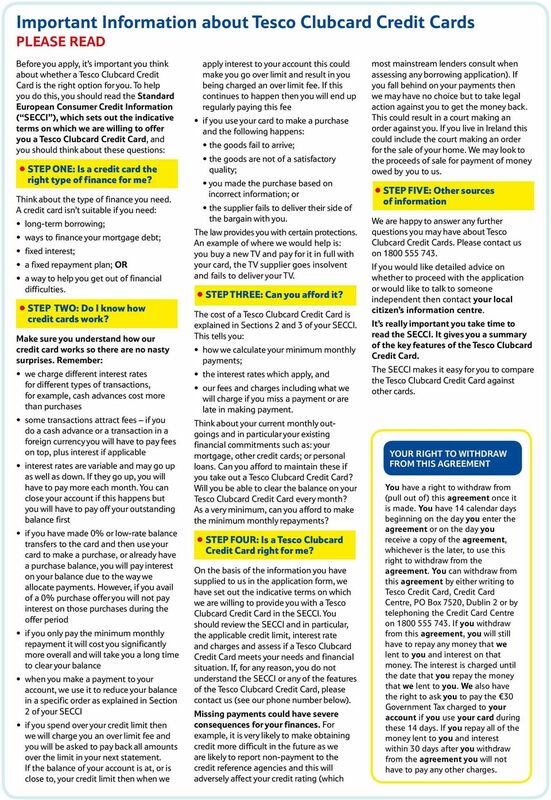 IMPORTANT INFORMATION AS AT MARCH Amount of credit limit: 2. Duration of agreement: 3. Number and frequency of repayment installments: 4. Amount of each installment: 5. Annual Percentage Rate of Charge (APR)*: 6. 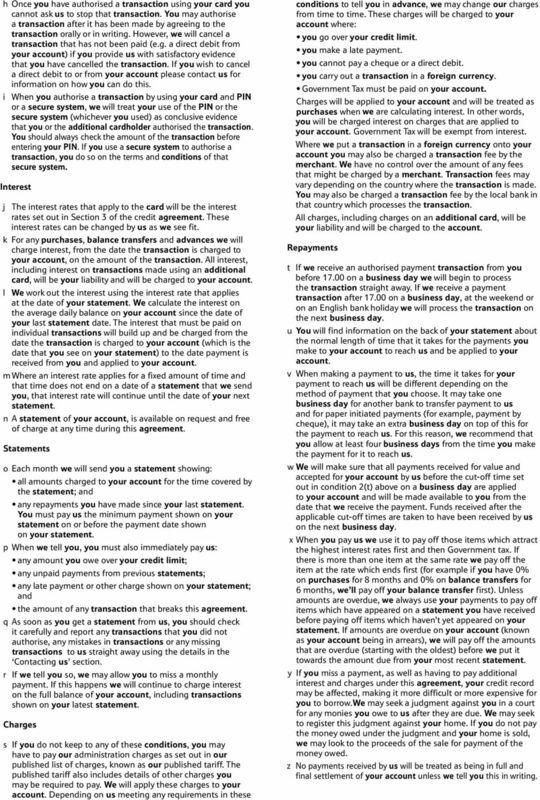 Total amount payable*: THIS IS A COPY OF YOUR AGREEMENT FOR YOU TO KEEP. This is a Tesco Clubcard Credit Card agreement made between us, (Tesco Personal Finance plc, P.O. Box 7520, Dublin 2) and you, the principal cardholder. 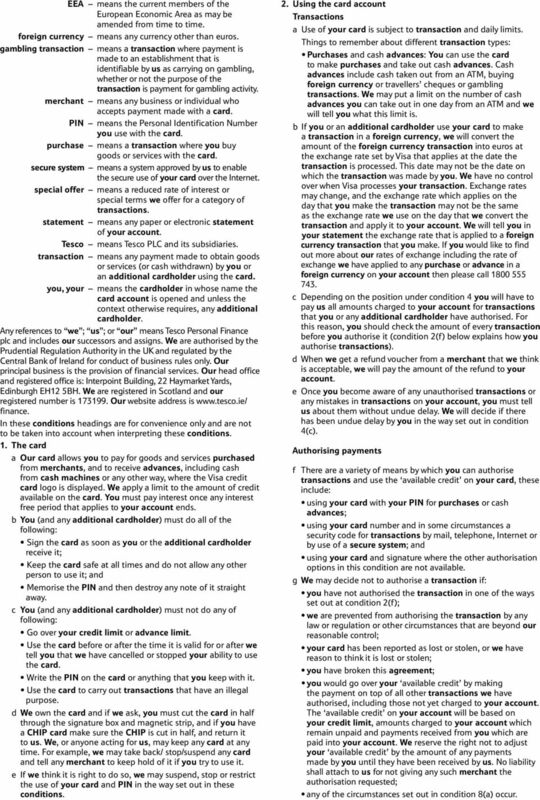 The following details about the card form part of the credit agreement between us and you. 1 We will set your credit limit and advance limit and we may reduce them at any time. The advance limit is 30% of the credit limit. We will give you written notice of any change. You can request a credit limit increase at any time. 2 Within 25 days after the date of each statement you must pay us at least the minimum payment shown on your statement. The minimum payment will be: 3% of the new balance shown on your statement; or 5.00; whichever is more. However, if the new balance is less than 5.00, you must pay the full new balance. 3 The rates of interest we charge, and the equivalent Annual Rates are shown below. 3a. Interest Rates Transaction Type Monthly Rate Annual Rate Balance transfers for the first 0.00% (fixed) 0.00% (fixed) 6 months from the account opening Balance transfers after the first 6 months from the account opening Purchases for the first 8 months from the account opening Purchases after the first 8 months from the account opening Credit limit is notified to you from time to time. No fixed period, see Condition 8 of the Terms and Conditions. No fixed number. Monthly (unless otherwise agreed). As detailed in financial details about the card below. Total cost of credit including any interest and fees 19.1%. 1, is what you might pay in year 1 if this happens: Your credit limit is 1,500 On opening the account you make one purchase with your card to the value of 1,470 plus Government Stamp Duty charge of 30.00; interest is charged at the standard rate for purchases; you repay the 1,500 purchase amount in 12 equal monthly payments of 125, each made on time;and during the year you don't carry out any more transactions and your interest rates don't change. Remember this is just an example and the total amount you might have to pay could vary. *The APR above is based on a representative credit limit of 1,500 and incorporates the highest interest rate applicable to purchases but does not incorporate the introductory interest rate % 14.9% 0.00% (fixed) 0.00% (fixed) 1.167% Advances from the start 1.298% 14.9% 16.7% For each advance (except gambling transactions) we will charge you: 1.5% of the amount of the advance; or 1.90; whichever is more. We may change the interest rates and charges. The Annual Rates shown above do not take account of any future changes to the interest rates and charges. 4 If you repay the full new balance shown on your statement within 25 days of the statement date, we will not charge you interest on any purchases shown on that statement. TESCO CLUBCARD CREDIT CARD TERMS AND CONDITIONS OF USE These Terms and Conditions are the rules for the use of your card. They are part of, and should be read with the credit agreement signed by us and you. When you use your card for the first time you are taken to have accepted these Terms and Conditions. MEANINGS OF WORDS AND PHRASES USED IN THIS AGREEMENT account means your credit card account. additional card means a card we issue to someone (an additional cardholder) nominated by you. additional cardholder means a cardholder appointed by you and permitted to use an additional card. advance means a transaction where you get cash, foreign currency, or travellers cheques or carry out a gambling transaction by using the card. advance limit means the most you are allowed to owe on your account at any time, by way of advances. agreement means this agreement between you and us as set out in these conditions, the card carrier and all other documents that are incorporated into these conditions or otherwise become part of the agreement from time to time. APR means the cost of credit calculated on an annual basis. balance transfer means a transaction where we repay a debt you owe to another financial institution and charge the amount of that debt to your account. business day means a day (other than a Saturday, Sunday or public holiday) on which we are generally open for business in the UK and, where a payment to an account with another bank is involved, on which the payee s bank is also open for business. card means the Tesco Clubcard Credit Card including any additional card supplied by us, under this agreement and incorporates all elements of that card, including without limitation, the CHIP. card carrier paper document that the plastic card is attached to. card holder means only the person in whose name the account is maintained and does not include additional cardholders. cash machine means a machine which dispenses cash and/or, in some cases, receives lodgements and/or performs other banking functions. CHIP means an integrated circuit embedded in a card. conditions means these Terms and Conditions as amended, extended, supplemented or replaced from time to time. credit limit means the maximum debit balance allowed on the account. 3 EEA means the current members of the European Economic Area as may be amended from time to time. foreign currency means any currency other than uros. gambling transaction means a transaction where payment is made to an establishment that is identifiable by us as carrying on gambling, whether or not the purpose of the transaction is payment for gambling activity. merchant means any business or individual who accepts payment made with a card. PIN means the Personal Identification Number you use with the card. purchase means a transaction where you buy goods or services with the card. secure system means a system approved by us to enable the secure use of your card over the Internet. special offer means a reduced rate of interest or special terms we offer for a category of transactions. statement means any paper or electronic statement of your account. Tesco means Tesco PLC and its subsidiaries. transaction means any payment made to obtain goods or services (or cash withdrawn) by you or an additional cardholder using the card. you, your means the cardholder in whose name the card account is opened and unless the context otherwise requires, any additional cardholder. Any references to we ; us ; or our means Tesco Personal Finance plc and includes our successors and assigns. We are authorised by the Prudential Regulation Authority in the UK and regulated by the Central Bank of Ireland for conduct of business rules only. Our principal business is the provision of financial services. Our head office and registered office is: Interpoint Building, 22 Haymarket Yards, Edinburgh EH12 5BH. We are registered in Scotland and our registered number is Our website address is finance. In these conditions headings are for convenience only and are not to be taken into account when interpreting these conditions. 1. The card a Our card allows you to pay for goods and services purchased from merchants, and to receive advances, including cash from cash machines or any other way, where the Visa credit card logo is displayed. We apply a limit to the amount of credit available on the card. You must pay interest once any interest free period that applies to your account ends. b You (and any additional cardholder) must do all of the following: Sign the card as soon as you or the additional cardholder receive it; Keep the card safe at all times and do not allow any other person to use it; and Memorise the PIN and then destroy any note of it straight away. c You (and any additional cardholder) must not do any of following: Go over your credit limit or advance limit. Use the card before or after the time it is valid for or after we tell you that we have cancelled or stopped your ability to use the card. Write the PIN on the card or anything that you keep with it. Use the card to carry out transactions that have an illegal purpose. d We own the card and if we ask, you must cut the card in half through the signature box and magnetic strip, and if you have a CHIP card make sure the CHIP is cut in half, and return it to us. We, or anyone acting for us, may keep any card at any time. For example, we may take back/ stop/suspend any card and tell any merchant to keep hold of it if you try to use it. e If we think it is right to do so, we may suspend, stop or restrict the use of your card and PIN in the way set out in these conditions. 2. Using the card account Transactions a Use of your card is subject to transaction and daily limits. Things to remember about different transaction types: Purchases and cash advances: You can use the card to make purchases and take out cash advances. Cash advances include cash taken out from an ATM, buying foreign currency or travellers cheques or gambling transactions. We may put a limit on the number of cash advances you can take out in one day from an ATM and we will tell you what this limit is. b If you or an additional cardholder use your card to make a transaction in a foreign currency, we will convert the amount of the foreign currency transaction into euros at the exchange rate set by Visa that applies at the date the transaction is processed. This date may not be the date on which the transaction was made by you. We have no control over when Visa processes your transaction. Exchange rates may change, and the exchange rate which applies on the day that you make the transaction may not be the same as the exchange rate we use on the day that we convert the transaction and apply it to your account. We will tell you in your statement the exchange rate that is applied to a foreign currency transaction that you make. If you would like to find out more about our rates of exchange including the rate of exchange we have applied to any purchase or advance in a foreign currency on your account then please call c Depending on the position under condition 4 you will have to pay us all amounts charged to your account for transactions that you or any additional cardholder have authorised. For this reason, you should check the amount of every transaction before you authorise it (condition 2(f) below explains how you authorise transactions). d When we get a refund voucher from a merchant that we think is acceptable, we will pay the amount of the refund to your account. e Once you become aware of any unauthorised transactions or any mistakes in transactions on your account, you must tell us about them without undue delay. We will decide if there has been undue delay by you in the way set out in condition 4(c). Authorising payments f There are a variety of means by which you can authorise transactions and use the available credit on your card, these include: using your card with your PIN for purchases or cash advances; using your card number and in some circumstances a security code for transactions by mail, telephone, Internet or by use of a secure system; and using your card and signature where the other authorisation options in this condition are not available. g We may decide not to authorise a transaction if: you have not authorised the transaction in one of the ways set out at condition 2(f); we are prevented from authorising the transaction by any law or regulation or other circumstances that are beyond our reasonable control; your card has been reported as lost or stolen, or we have reason to think it is lost or stolen; you have broken this agreement; you would go over your available credit by making the payment on top of all other transactions we have authorised, including those not yet charged to your account. The available credit on your account will be based on your credit limit, amounts charged to your account which remain unpaid and payments received from you which are paid into your account. We reserve the right not to adjust your available credit by the amount of any payments made by you until they have been received by us. No liability shall attach to us for not giving any such merchant the authorisation requested; any of the circumstances set out in condition 8(a) occur. 4 h Once you have authorised a transaction using your card you cannot ask us to stop that transaction. You may authorise a transaction after it has been made by agreeing to the transaction orally or in writing. However, we will cancel a transaction that has not been paid (e.g. a direct debit from your account) if you provide us with satisfactory evidence that you have cancelled the transaction. If you wish to cancel a direct debit to or from your account please contact us for information on how you can do this. i When you authorise a transaction by using your card and PIN or a secure system, we will treat your use of the PIN or the secure system (whichever you used) as conclusive evidence that you or the additional cardholder authorised the transaction. You should always check the amount of the transaction before entering your PIN. If you use a secure system to authorise a transaction, you do so on the terms and conditions of that secure system. Interest j The interest rates that apply to the card will be the interest rates set out in Section 3 of the credit agreement. These interest rates can be changed by us as we see fit. k For any purchases, balance transfers and advances we will charge interest, from the date the transaction is charged to your account, on the amount of the transaction. All interest, including interest on transactions made using an additional card, will be your liability and will be charged to your account. l We work out the interest using the interest rate that applies at the date of your statement. We calculate the interest on the average daily balance on your account since the date of your last statement date. The interest that must be paid on individual transactions will build up and be charged from the date the transaction is charged to your account (which is the date that you see on your statement) to the date payment is received from you and applied to your account. m Where an interest rate applies for a fixed amount of time and that time does not end on a date of a statement that we send you, that interest rate will continue until the date of your next statement. n A statement of your account, is available on request and free of charge at any time during this agreement. Statements o Each month we will send you a statement showing: all amounts charged to your account for the time covered by the statement; and any repayments you have made since your last statement. You must pay us the minimum payment shown on your statement on or before the payment date shown on your statement. p When we tell you, you must also immediately pay us: any amount you owe over your credit limit; any unpaid payments from previous statements; any late payment or other charge shown on your statement; and the amount of any transaction that breaks this agreement. q As soon as you get a statement from us, you should check it carefully and report any transactions that you did not authorise, any mistakes in transactions or any missing transactions to us straight away using the details in the Contacting us section. r If we tell you so, we may allow you to miss a monthly payment. If this happens we will continue to charge interest on the full balance of your account, including transactions shown on your latest statement. Charges s If you do not keep to any of these conditions, you may have to pay our administration charges as set out in our published list of charges, known as our published tariff. The published tariff also includes details of other charges you may be required to pay. We will apply these charges to your account. Depending on us meeting any requirements in these conditions to tell you in advance, we may change our charges from time to time. These charges will be charged to your account where: you go over your credit limit. you make a late payment. you cannot pay a cheque or a direct debit. you carry out a transaction in a foreign currency. Government Tax must be paid on your account. Charges will be applied to your account and will be treated as purchases when we are calculating interest. In other words, you will be charged interest on charges that are applied to your account. Government Tax will be exempt from interest. Where we put a transaction in a foreign currency onto your account you may also be charged a transaction fee by the merchant. We have no control over the amount of any fees that might be charged by a merchant. Transaction fees may vary depending on the country where the transaction is made. You may also be charged a transaction fee by the local bank in that country which processes the transaction. All charges, including charges on an additional card, will be your liability and will be charged to the account. Repayments t If we receive an authorised payment transaction from you before on a business day we will begin to process the transaction straight away. If we receive a payment transaction after on a business day, at the weekend or on an English bank holiday we will process the transaction on the next business day. u You will find information on the back of your statement about the normal length of time that it takes for the payments you make to your account to reach us and be applied to your account. v When making a payment to us, the time it takes for your payment to reach us will be different depending on the method of payment that you choose. It may take one business day for another bank to transfer payment to us and for paper initiated payments (for example, payment by cheque), it may take an extra business day on top of this for the payment to reach us. For this reason, we recommend that you allow at least four business days from the time you make the payment for it to reach us. w We will make sure that all payments received for value and accepted for your account by us before the cut-off time set out in condition 2(t) above on a business day are applied to your account and will be made available to you from the date that we receive the payment. Funds received after the applicable cut-off times are taken to have been received by us on the next business day. x When you pay us we use it to pay off those items which attract the highest interest rates first and then Government tax. If there is more than one item at the same rate we pay off the item at the rate which ends first (for example if you have 0% on purchases for 8 months and 0% on balance transfers for 6 months, we ll pay off your balance transfer first). Unless amounts are overdue, we always use your payments to pay off items which have appeared on a statement you have received before paying off items which haven t yet appeared on your statement. If amounts are overdue on your account (known as your account being in arrears), we will pay off the amounts that are overdue (starting with the oldest) before we put it towards the amount due from your most recent statement. y If you miss a payment, as well as having to pay additional interest and charges under this agreement, your credit record may be affected, making it more difficult or more expensive for you to borrow.we may seek a judgment against you in a court for any monies you owe to us after they are due. We may seek to register this judgment against your home. If you do not pay the money owed under the judgment and your home is sold, we may look to the proceeds of the sale for payment of the money owed. z No payments received by us will be treated as being in full and final settlement of your account unless we tell you this in writing. 6 helping us and Tesco to understand and develop our and their business including new and innovative products and services; and meeting our obligations under the credit card scheme your card is issued under. We may link your information between your account and other products and services you have with us and Tesco. We may link your information with information about others with whom you have a financial link. We will not use the links for marketing purposes unless you agree. c As our business and our relationship with you develop, how we look at, record and use your information may change. In most cases these changes will result from enhancements in technology and, we think, will be in line with what you would expect. If we think the changes may not be obvious to you, we will tell you. You can write to us to tell us that you don t want us to use your information in the new way but if you keep your card for at least 60 days after we tell you about a change, you agree to the change. d We may share your information with Tesco and Tesco group companies. In particular, because your credit card operates as a Clubcard, we will share your information with Tesco for the operation of your Clubcard account: to process Clubcard points earned from your credit card; to provide the information required where a new Clubcard account is being created; and for marketing purposes (but only where you agree to this). Clubcard accounts are managed separately and you should visit the Clubcard privacy notice at tesco.ie/clubcard for further information about how Clubcard uses your information. We won t give anyone other than Tesco your information except: if we have to for operational reasons given in this agreement; if you agree; if we must or can for legal reasons; if your card or PIN is lost, stolen or might be misused; to anyone, including insurers, who gives a service to us provided they agree to keep your information strictly confidential; to anyone, including insurers and lenders, who gives you benefits or services to do with your card; and to credit reference agencies as set out below. e In order to provide the services you have requested or may request from time to time, it may be necessary for your information to be transferred to someone who provides a service to us in other countries. If we do this we will ensure that anyone to whom we pass your information agrees to treat your information with the same level of protection as if we were dealing with it. f You can ask for a copy of your personal records we hold by writing to us at Data Protection Officer, Tesco Clubcard Credit Card, Card Customer Services, PO Box 7520, Dublin 2. We may charge you a fee. You are entitled to have only inaccurate information that we hold about you corrected or deleted. g We may share with any other member of Visa, or our agents, any information or details about your account at any time so that we can meet our obligations under this agreement to operate the account on your behalf. Credit Reference and Fraud Prevention Agencies h We may make searches of Tesco records, credit reference and fraud prevention agencies from time to time to manage your account with us, to take decisions about the credit that we give you, including whether to give or continue to give credit to you. The searches will not be seen or used by lenders to check if you are able to get credit. Where a request from you for credit is turned down because of the results we get when we check with a credit reference agency, we will let you know. i Where you borrow or may borrow from us, we may give details of your account and how you manage it to credit reference agencies. If you borrow and do not repay in full and on time, we may tell credit reference agencies who will record your outstanding debt. j If false or incorrect information is provided and fraud is identified or suspected by us or if we think there is a fraud, details of this may be passed by us to fraud prevention agencies. Law enforcement agencies may access and use this information. We and other organisations may also access and use this information to prevent fraud and money laundering, for example when: checking applications for, and managing credit or other facilities and recovering debt; checking insurance proposals and claims; checking details of job applicants and employees. We, and other organisations that may access and use information recorded by fraud prevention agencies, may do so from other countries. k You have the right of access to your personal records held by credit reference and fraud prevention agencies. If you ask, we will tell you the names and addresses of the agencies we use. l If you need to write to us our address is: Tesco Clubcard Credit Card, Card Customer Services, PO Box 7520, Dublin Giving out information You agree that we can give any person that we think fit any relevant information: in connection with the loss, theft or possible misuse of your card or the PIN; or so we can meet our obligations as a member of the Visa card scheme the card is issued under. 7. Recovering all amounts due a Depending upon the relevant legal position and any legal rights that you may have, we may recover all amounts due under this agreement straight away when you are declared bankrupt, die or break any of these conditions. b We may charge your account with any costs or expenses we are charged with while enforcing this right to recover payment straight away. 8. Ending the agreement a The agreement will continue until it is ended by either you or us. We may end the agreement straight away if you become bankrupt; if you enter into a voluntary arrangement with your creditors; if you are no longer, in our opinion, able to manage your financial affairs; if you die; if you seriously, or repeatedly, break these conditions; if you break any other agreement with us; if we must do so because of any law; if you use your account for any illegal or other improper purposes; or if for any reason this agreement cannot be enforced or is not valid. b Unless we are allowed by law to give you shorter notice, we may also close your account for any other reason by telling you in writing at least two months in advance. c We may tell you about your account being closed by publishing a notice in a national daily newspaper, by telling you in writing or through our website or in any other way required or allowed by law. d You may end the agreement at any time by telling us in writing that you want to end the agreement. e If you end the agreement you must return all cards (cut in half through the signature box and magnetic strip, and if you have a CHIP card, with the CHIP cut in half) and repay all the amounts you owe under the agreement. f When the agreement ends we will continue to apply interest and charges to the amounts that you owe until you have paid everything you owe under the agreement. g If we end the agreement, we may give information about you and your account to credit reference agencies. 9. Changes to the agreement a These conditions apply to your account unless and until they are changed by us in the way allowed by this condition. b We may change the terms of this agreement at any time to reflect changes in: market conditions; good banking practice; and relevant laws. 7 c Unless we are allowed by law to give you shorter notice, we will tell you at least two months in advance of any change to these conditions. You have the right to end the agreement during this two month period so long as you pay all amounts owing on the card account, including all charges and interest, and you return all cards issued on your account. You are taken to have agreed to the changed terms if you use your card after this two month period ends or if you do not tell us that you do not agree to the changes before the date that the changes happen. d We may tell you of any change to these conditions by publishing a notice of the change in a national daily newspaper, by telling you in writing or through our website or by any other way required or allowed by law. e If we have made a major change or a lot of minor changes in any one year, we will give you a copy of the new Terms and Conditions or a summary of the changes. 10. Transferring debts We may transfer, assign or securitise all or any of our rights under this agreement and/or all or part of the debt owed by you under this agreement to any person or entity without telling you. You agree that we can share any financial or other information about you, the additional cardholder and/or this agreement with the person or entity that the rights and/or debt are transferred to. 11. Questions, disputes and complaints a You should check carefully all statements and any other account information that we send you or that you access online and report any transactions you did not authorise, mistakes in transactions or missing transactions to us straight away. If you have a question about a transaction on your account please contact us straight away. Our contact details are set out in the Contacting us section. If there has been undue delay on your part in contacting us we may not be able to compensate you for any loss you may have suffered. We will normally consider that there has been undue delay on your part if you do not contact us within 30 days of you receiving the statement that sets out the transaction that has given rise to the problem or, where the problem is a missing transaction, within 30 days of receiving the statement that should contain the transaction. b If you want to make a complaint you may do so by writing to us using the details in the Contacting us section. If you are still not satisfied and you come within the power of the Financial Services Ombudsman, you have the right to take your complaint to the Financial Services Ombudsman, 3rd Floor, Lincoln House, Lincoln Place, Dublin 2. Further details of our complaints procedures may be obtained by contacting us. 12. General a We are not liable to you if we cannot provide any part of our service for a reason beyond our control (for example, a strike or if power supplies or equipment fail). If we cannot produce or send statements to you for any reason beyond our control, or you do not receive any statement, your responsibilities under the agreement will continue. b You can obtain a copy of these conditions and all other documents that make up the agreement from us by contacting us using the details set out in the Contacting us section. c If your name or address changes you must tell us in writing. d If we do not enforce any condition of this agreement, or we delay in enforcing the condition, this will not prevent us from enforcing the condition at a later date. e We will communicate with you in English unless we agree otherwise. f The card is available to people who live in the Republic of Ireland. g For your security, we may record and/or monitor phone calls between you, us and any additional cardholder for your protection and to make sure we are providing a high-quality service and following your instructions correctly. h We may, at any time, share with any other member of Visa or our agents any data or details relating to your account so that we can meet our obligations under this agreement to operate the account on your behalf. i No provision of this agreement shall affect or be taken to affect any legal rights you have under the consumer credit law that applies in this situation. If there is any conflict between this agreement and your legal rights, your legal rights will prevail over this agreement. j All charges must be approved by the Central Bank of Ireland and charges can only be increased with the Central Bank of Ireland s approval. k If you have selected to purchase the optional Tesco Bank Payment Protection Insurance, we act as your agent in relation to this insurance product. As an agent, we hold an appointment from you, we pass on orders on your behalf to the insurer and from time to time, we may change insurer on your behalf. l If, at any time, any provision of the agreement is or becomes invalid, illegal or unenforceable in any respect, this will not affect or impair, in any way, the validity, legality and enforceability of the remaining provisions of the agreement. 13. Payment Protection Insurance a If you have selected to purchase the optional Tesco Bank Payment Protection Insurance (PPI), we will add the monthly insurance premium (payment) to your account. We will treat this insurance premium as a purchase transaction. This means that where interest is due, you will pay interest on the insurance premium and this interest will be charged at the interest rate that applies to purchases made by you. We transfer your premium to your insurer. b Where you make a valid claim on your PPI, your insurer will pay the compensation directly to us. We will use the payment to clear all or as much as possible of your debt under this agreement. 14. Contacting us a At the date of issue of these conditions our contact details are as set out below. These may change from time to time and up-to-date details can be found on your statements. Our address is: Tesco Clubcard Credit Card, Card Customer Services, PO Box 7520, Dublin 2. For lost, stolen or misused cards telephone us, 24 hours a day, at: if calling from within the Republic of Ireland, otherwise call us on Contacting you b Depending upon the position under any applicable law we may contact you by post, fax, phone, online, or in person. 15. Governing Law & Jurisdiction a The agreement is governed by the laws of Ireland and both you and we hereby submit to the exclusive jurisdiction of the Irish Courts. 16. Tariff of Charges If you cannot pay a cheque or direct debit 4.44 If you go over your credit limit 6.35 If you make a late payment 6.35 If you carry out a transaction in a foreign currency 1.75% Government Tax (Charged annually in April or on the closure of your account) 30 YOUR RIGHT TO WITHDRAW FROM THIS AGREEMENT You have a right to withdraw from (pull out of) this agreement once it is made. You have 14 calendar days beginning on the day you enter the agreement or on the day you receive a copy of the agreement, whichever is the later, to use this right to withdraw from the agreement. 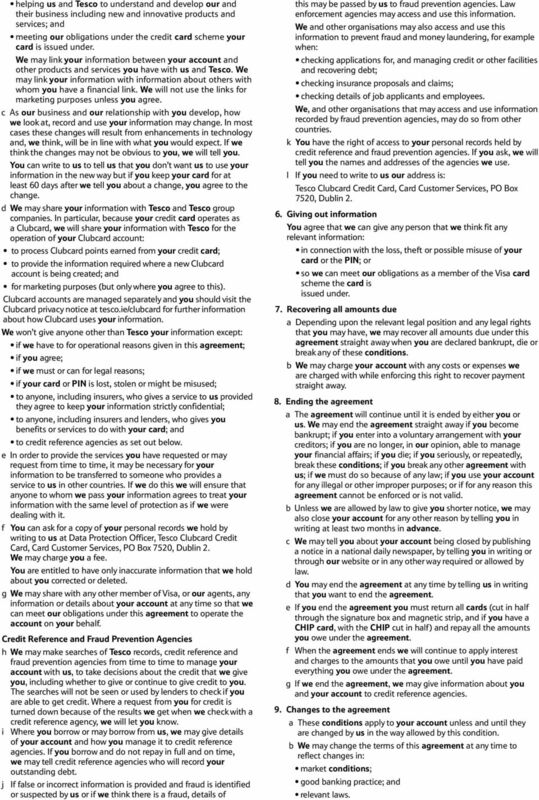 You can withdraw from this agreement by either writing to Tesco Credit Card, Credit Card Centre, PO Box 7520, Dublin 2 or by telephoning the Credit Card Centre on If you withdraw from this agreement, you will still have to repay any money that we lent to you and interest on that money. The interest is charged until the date that you repay the money that we lent to you. We also have the right to ask you to pay the 30 Government Tax charged to your account if you use your card during these 14 days. If you repay all of the money lent to you and interest within 30 days after you withdraw from the agreement you will not have to pay any other charges. 8 Important Information about Tesco Clubcard Credit Cards PLEASE READ Before you apply, it s important you think about whether a Tesco Clubcard Credit Card is the right option for you. To help you do this, you should read the Standard European Consumer Credit Information ( SECCI ), which sets out the indicative terms on which we are willing to offer you a Tesco Clubcard Credit Card, and you should think about these questions: STEP ONE: Is a credit card the right type of finance for me? Think about the type of finance you need. A credit card isn t suitable if you need: long-term borrowing; ways to finance your mortgage debt; fixed interest; a fixed repayment plan; OR a way to help you get out of financial difficulties. STEP TWO: Do I know how credit cards work? Make sure you understand how our credit card works so there are no nasty surprises. Remember: we charge different interest rates for different types of transactions, for example, cash advances cost more than purchases some transactions attract fees if you do a cash advance or a transaction in a foreign currency you will have to pay fees on top, plus interest if applicable interest rates are variable and may go up as well as down. If they go up, you will have to pay more each month. You can close your account if this happens but you will have to pay off your outstanding balance first if you have made 0% or low-rate balance transfers to the card and then use your card to make a purchase, or already have a purchase balance, you will pay interest on your balance due to the way we allocate payments. However, if you avail of a 0% purchase offer you will not pay interest on those purchases during the offer period if you only pay the minimum monthly repayment it will cost you significantly more overall and will take you a long time to clear your balance when you make a payment to your account, we use it to reduce your balance in a specific order as explained in Section 2 of your SECCI if you spend over your credit limit then we will charge you an over limit fee and you will be asked to pay back all amounts over the limit in your next statement. If the balance of your account is at, or is close to, your credit limit then when we apply interest to your account this could make you go over limit and result in you being charged an over limit fee. If this continues to happen then you will end up regularly paying this fee if you use your card to make a purchase and the following happens: the goods fail to arrive; the goods are not of a satisfactory quality; you made the purchase based on incorrect information; or the supplier fails to deliver their side of the bargain with you. The law provides you with certain protections. An example of where we would help is: you buy a new TV and pay for it in full with your card, the TV supplier goes insolvent and fails to deliver your TV. STEP THREE: Can you afford it? The cost of a Tesco Clubcard Credit Card is explained in Sections 2 and 3 of your SECCI. This tells you: how we calculate your minimum monthly payments; the interest rates which apply, and our fees and charges including what we will charge if you miss a payment or are late in making payment. Think about your current monthly outgoings and in particular your existing financial commitments such as: your mortgage, other credit cards; or personal loans. Can you afford to maintain these if you take out a Tesco Clubcard Credit Card? Will you be able to clear the balance on your Tesco Clubcard Credit Card every month? As a very minimum, can you afford to make the minimum monthly repayments? STEP FOUR: Is a Tesco Clubcard Credit Card right for me? 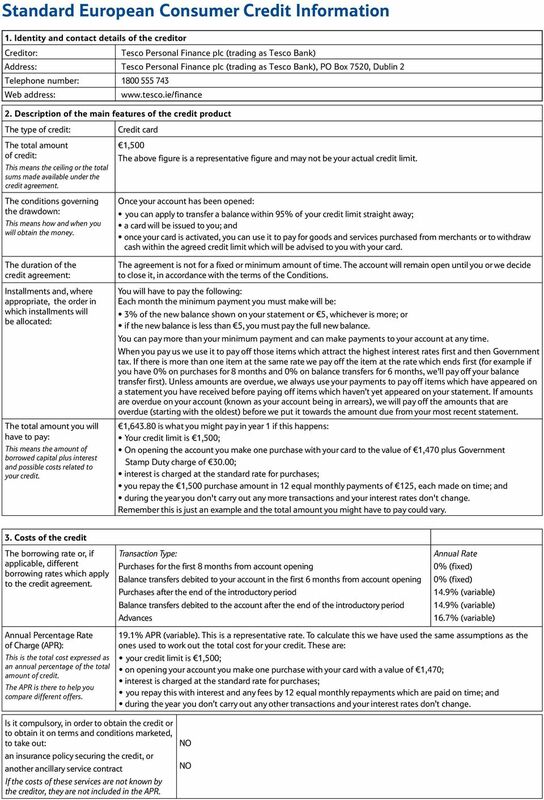 On the basis of the information you have supplied to us in the application form, we have set out the indicative terms on which we are willing to provide you with a Tesco Clubcard Credit Card in the SECCI. You should review the SECCI and in particular, the applicable credit limit, interest rate and charges and assess if a Tesco Clubcard Credit Card meets your needs and financial situation. If, for any reason, you do not understand the SECCI or any of the features of the Tesco Clubcard Credit Card, please contact us (see our phone number below). Missing payments could have severe consequences for your finances. For example, it is very likely to make obtaining credit more difficult in the future as we are likely to report non-payment to the credit reference agencies and this will adversely affect your credit rating (which most mainstream lenders consult when assessing any borrowing application). If you fall behind on your payments then we may have no choice but to take legal action against you to get the money back. This could result in a court making an order against you. If you live in Ireland this could include the court making an order for the sale of your home. We may look to the proceeds of sale for payment of money owed by you to us. STEP FIVE: Other sources of information We are happy to answer any further questions you may have about Tesco Clubcard Credit Cards. Please contact us on If you would like detailed advice on whether to proceed with the application or would like to talk to someone independent then contact your local citizen s information centre. It s really important you take time to read the SECCI. It gives you a summary of the key features of the Tesco Clubcard Credit Card. The SECCI makes it easy for you to compare the Tesco Clubcard Credit Card against other cards. YOUR RIGHT TO WITHDRAW FROM THIS AGREEMENT You have a right to withdraw from (pull out of) this agreement once it is made. You have 14 calendar days beginning on the day you enter the agreement or on the day you receive a copy of the agreement, whichever is the later, to use this right to withdraw from the agreement. You can withdraw from this agreement by either writing to Tesco Credit Card, Credit Card Centre, PO Box 7520, Dublin 2 or by telephoning the Credit Card Centre on If you withdraw from this agreement, you will still have to repay any money that we lent to you and interest on that money. The interest is charged until the date that you repay the money that we lent to you. We also have the right to ask you to pay the 30 Government Tax charged to your account if you use your card during these 14 days. If you repay all of the money lent to you and interest within 30 days after you withdraw from the agreement you will not have to pay any other charges. 10 Related costs: Amount of costs deriving from the credit agreement Amount of costs for using a specific means of payment Conditions under which the above mentioned costs, related to the credit agreement, can be changed: Our charges are: For each advance (except gambling transactions): (a) 1.5% of the amount of the advance; or (b) 1.90; whichever is more. Government Tax (charged annually in April or on the closure of your account): if you cannot pay a cheque or direct debit. If you go over your credit limit: For transactions in foreign currencies, we will charge you 1.75% of the value of every transaction. We may change the costs mentioned above as set out in the credit agreement from time to time. Unless we are permitted by law to give you shorter notice, we will give you at least two months' notice in advance of any alteration to these conditions. We will notify you of any alteration to these conditions by publishing a notice of the change in a national daily newspaper or by notice in writing or through our website or by means of another durable medium or by any other means permitted by law. Costs in the case of late payments: Missing payments could have severe consequences for you and make obtaining credit more difficult. You will be charged: (a) the applicable interest rate as detailed above, which can be varied from time to time at our absolute discretion; and (b) 6.35 for late payments. We may charge your account with any costs or expenses we run up enforcing our right to recover immediate payment. Interest on these fees will be calculated from the 29th day after you are sent a Notice of Default Sums until repayment. The interest is calculated on a simple basis and will be charged at the same rate as your purchases. IMPORTANT! Please remember missing payments has serious consequences and could result in us taking legal action against you and affect your ability to get credit (e.g. a credit card or a mortgage) in the future. 4. Other important legal aspects Right of withdrawal: YES You have the right to withdraw from the credit agreement within a period of 14 calendar days. Early repayment: You have the right to repay the credit early at any time in full or partially. Consultation of a database: The creditor must inform you, immediately and without charge, of the result of a consultation of a database, if a credit application is rejected on the basis of such a consultation. This does not apply if the provision of such information is prohibited by European Community law or is contrary to objectives of public policy or public security. You can make payments to your account at any time. You have the right to repay your card at any time by repaying the outstanding balance on the card and all outstanding card transactions, fees and charges. We will inform you, straight away and without charge, of the result of a database consultation with a credit reference agency if your credit application is rejected on the basis of such a consultation. Right to a draft credit agreement: You have the right, upon request, to obtain a copy of the draft credit agreement free of charge. This provision does not apply if the creditor is, at the time of the request, unwilling to proceed to the conclusion of the credit agreement with you. You have the right, upon request, to a copy of the draft credit agreement free of charge. 5. Additional information in the case of distance marketing of financial services Registration: The supervisory authority: (b) Concerning the credit agreement. Exercise of the right of withdrawal: Tesco Personal Finance plc (trading as Tesco Bank) is authorised by the Prudential Regulation Authority in the UK and is regulated by the Central Bank of Ireland for conduct of business rules. Tesco Personal Finance plc (trading as Tesco Bank) is authorised by the Prudential Regulation Authority in the UK and is regulated by the Central Bank of Ireland for conduct of business rules. You have a right to withdraw from (pull out of) this agreement once it is made. You have 14 calendar days beginning on the day you enter the agreement or on the day you receive a copy of the agreement, whichever is the later, to use this right to withdraw from the agreement. 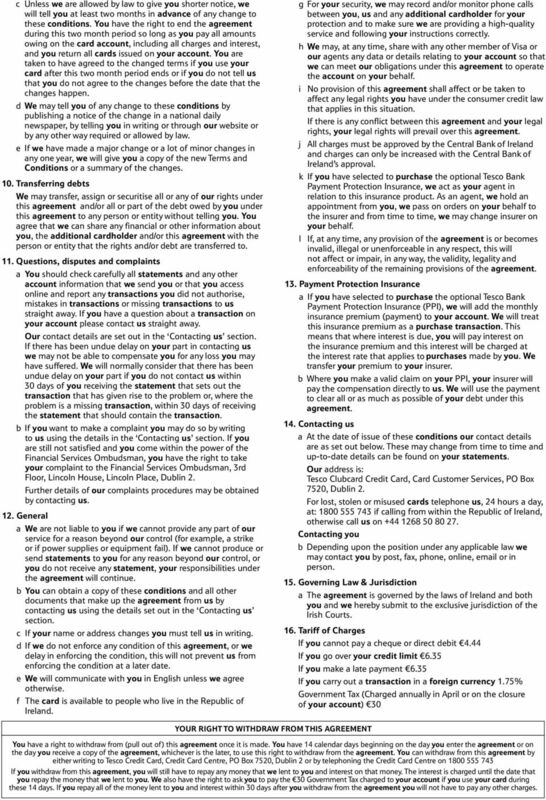 You can withdraw from this agreement by either writing to Tesco Credit Card, Credit Card Centre, PO Box 7520, Dublin 2 or by telephoning the Credit Card Centre on If you withdraw from this agreement, you will still have to repay any money that we lent to you and interest on that money. The interest is charged until the date that you repay the money that we lent to you. We also have the right to ask you to pay the 30 Government Tax charged to your account if you use your card during these 14 days. If you repay all of the money lent to you and interest within 30 days after you withdraw from the agreement you will not have to pay any other charges. 11 The law taken by the creditor as a basis for the establishment of relations with you before the conclusion of the credit contract: Clause stipulating the governing law applicable to the credit agreement and/or the competent court: Language regime: Irish law will govern the establishment of relations with you before the conclusion of the credit agreement. The agreement is governed by the laws of Ireland and both you and we hereby submit to the exclusive jurisdiction of the Irish Courts. Information and contractual terms will be supplied in English. With your consent, we intend to communicate in English for the duration of the credit agreement. (c) Concerning redress. Existence of and access to out-of-court complaint and redress mechanism: If you wish to make a complaint, you can write to us directly using the contact details in the Contacting us section. If you are still not satisfied and you come within the jurisdiction of the Financial Services Ombudsman, you are entitled to take your complaint to the Financial Services Ombudsman, 3rd Floor, Lincoln House, Lincoln Place, Dublin 2.